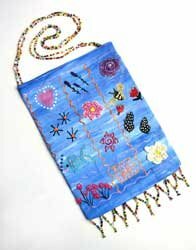 This fun & funky fabric painted handbag can be made to match any outfit. It is so easy, you can, by just changing your designs and colours, make more than one. Before starting, trace your design onto the fabric with a pencil. To create the background of the bag, use Dala Fabric Paint to paint the fabric. TIP: To create a streaky effect, put two colours next to each other (we used transparent blue and white) on a plate or piece of plastic. Scoop the paint together on a brush or sponge and paint the fabric. Firstly, decorate the areas where you want to use Dala Puff Paint. Using a paintbrush, apply the Puff Paint to fabric. Always try working evenly with this paint, as unevenness can create a polystyrene effect. Allow to dry slightly before heat setting – use a hair dryer, or bake the fabric in your kitchen oven at 120°C for 5 minutes, or wait until completely dry and iron with a hot iron on the fabric’s reverse side. Secondly, start working with Dala Fabric Artliners, drawing and outlining designs, or writing words. To add sparkle to your designs, use the glitter Artliners. To paint the feathers, use a black Artliner to draw a line. Using a small brush, “scoop” up some of the liner and flick your brush to the sides. This will give you an uneven look – perfect for painting feathers, as you don’t want any definite lines. Wait till dry before adding white dots with your white Artliner. Allow Artliners to dry completely before heat setting by ironing on the reverse side of the fabric for at least 5-10 minutes with a hot, dry iron (no steam). TIP: To avoid any smudging, always work from the top of your design/fabric, downwards. Thirdly, stitch the fabric to make the handbag. TIP: Hand wash in cold water. Do not rub the paint or liners, as this tends to fade the colours. Now, thread the beaded handle till 1m cotton is complete. Then tie two ends together with a double knot and sew handle to the inside of the bag. To create the tassels, use thread and needle to pick up required amount of beads and form a suitable pattern for your handbag. TIP: Any twine, cord or ribbon can be used for the handle. Measure the length beforehand to ensure that it is comfortable. Beaded tassels can be replaced with any other decorative material, for example feathers. The Dala Fabric Paints Range is made from the highest quality pigments and binders, is environmentally friendly and can be used by children as well as professional crafters. This range’s formulation is 100% water-based and free from solvents and their harmful odours. Dala’s extra fine Fabric Artliners can provide brilliantly accurate detail, making it indispensable to all crafters. Because of its specially designed applicator nozzle, very fine and accurate work can be achieved. They are not only great for highlighting or outlining designs, but also to use on its own as a writing or drawing tool. This item has 894 views.